Technology Workforce – What it takes to get in? The article claims that nearly 90% of Twitter’s and U.S. technology staff in general are held by whites or Asians. The article laments that the ethnic and gender makeup of the staff does not match the wide diversity of the users of the technologies and services of those companies. It hints that the companies should do more to add diversity to their workforce. This whole argument is ludicrous to me. 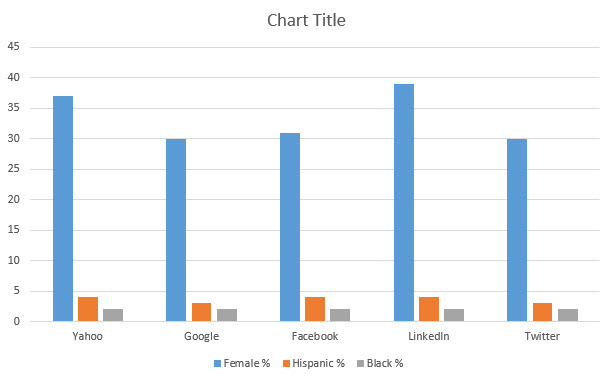 Do we really believe that Twitter purposely does not hire blacks and Hispanics but favors Asians? Only 30% of Twitter’s workforce are women because of all the qualified people who apply for jobs there, apparently only 30% are women. Are we suggesting that technology companies should reject white and Asian males who are most qualified for less qualified women and non-Asian minorities so that they may water down the technical expertise and therefore competitiveness of the companies and products? I do not know why only 30 to 39 percent of women are interested to get the education and experience necessary to land jobs at the major technology firms. I do not know why not enough African and Hispanic Americans get sufficient technology educations and qualifications to land those jobs. For some reason, it may be educational foundation, it may be cultural background and history, some of these minorities just don’t qualify. We need to deal with that. Why is it that Asian Americans are represented in disproportionately large numbers? Could it be because their culture and background fosters education and hard work? Could it be because Asians spend some 20 hours more in school every week than the average Americans? Indicating that there should be some type of technical affirmative action within these organizations to reduce qualified white, Asian and male hires in favor of lesser qualified minorities or women is ludicrous. Yahoo, Google, Facebook, LinkedIn and Twitter didn’t get to where they are by hiring because of gender or race. They became what they are because they have perfected the art of hiring the best they can get their hands on and promoting and rewarding those employees to keep them. Counterproductive articles like this one in the USA Today damage our economy by misguiding public opinion and fostering an attitude of entitlement among our young people. The reality is: if you want a high-paying technology job at one of the big companies in Silicon Valley, you have work hard in high school, get into some good technology college, compete there with the best and brightest from all over our country as well as the cream of the crop from China, India and all over the world, perhaps go to graduate school because many of the applicants to these firms have masters and doctorate degrees, and do a few years of grunt work in lesser firms or startups to gain job experience. Then, if you are willing to work 80 hour weeks and move to the highly expensive Bay Area, you can go and apply. If you have enough communications and personal skills to make it through the interview process, you might just land such a job. Nobody cares what gender, race or ethnicity you are.